This first floor flat comprises two bedrooms and one shower room with a third double bed in a study area near the front. It boasts an outside decked balcony with views across the harbour to Brownsea Island.The comfortable living room with soft leather sofas also has a dining area. The kitchen is modern and fully equipped including a washing machine. The flat also has BT broadband and tv. We mainly offer 7 day stays but please email if you are looking at shorter stays. We will endeavour to accommodate you where possible. We live in Bristol and love visiting the Sandbanks area as it has so much to offer from beaches to walking to sports and activities for the children. Closeness to the beach and harbour is ideal for us as well as being situated in a block with a Tesco Express means there's only a short trip for milk and fresh bread! 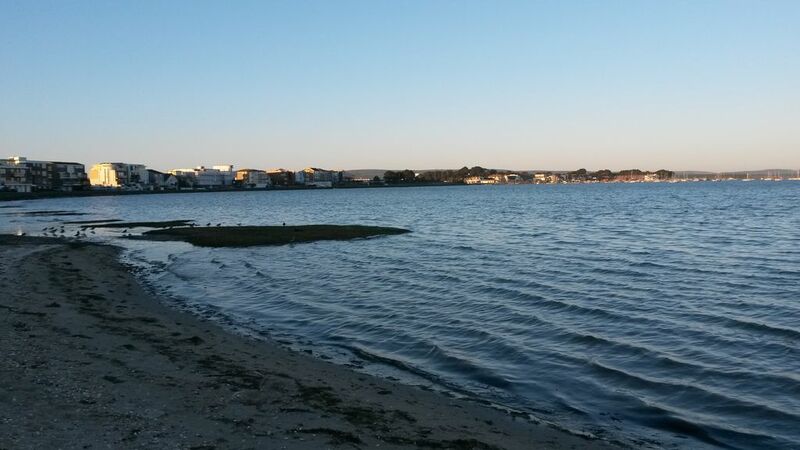 The flat is in an ideal location on the Sandbanks Penninsula. It offers an affordable solution for those wishing to visit the area. There is a dedicated parking space for the property right outside which is ideal in this area. The kitchen is modern and fully equipped with all utensils, pots and pans, hob and oven, microwave, kettle and toaster. It has a washing machine but no dishwasher. With the beach and harbour only a stones throw away, activities can be enjoyed without travelling or much preparation. Although BBQs are not permitted in the property, they can be enjoyed on the beach or harbour areas. Poole with its major shops and supermarkets is only a 10 minute drive away. The Sandbanks area showcases some very exclusive properties which can be seen when walking around. The main beach area has a cafe and ice cream kiosks and has a fantastic sandy beach for all to enjoy. As a family of four with two children, we have always enjoyed the area and have found there's always plenty of activities on offer as well as space to relax and unwind. This property although smaller than many exclusive Sandbanks properties has an outside balcony looking across to Brownsea Island. It also has a dedicated parking space saving on expensive parking charges. The location is ideal for exploring Sandbanks and the Poole area. Electric heaters are in the living room and main bedroom. Fresh white linen is provided at each changeover except for travel cots. BT home hub is installed. Bathroom and kitchen towels are provided at each changeover. Guests need to supply their own beach towels. Two comfortable leather sofas and coffee tables are in the living room as well as digital tv. A large dining table and chairs is in the lounge area. A highchair and booster seat are available. BT to and BT sports are available. A small decked balcony leads off the living room overlooking Poole harbour and Brownsea Island. The Watersports Academy near the flat offers all water sports and wetsuit hire. Available from the Watersports Academy. The flat offers an ideal space for a holiday or short break for families and couples alike. Fresh linens and towels are provided as well as a welcome pack. The property was nice and adequate and had everything needed for a stay of this length. Nice touch to have beach towels provided. We stayed at the flat a few weeks ago and found it perfect for our needs. The hot weather meant we spent a lot of time at the beach - a 3 minute walk away - or sitting on the balcony enjoying harbour views. The flat seems to have been recently refurbished with nice kitchen and bathroom. Having 3 bedrooms all with double beds was perfect for our group. My niece enjoyed using the bodyboard she found under the bed. It will be interesting to see what happens to the building when the works are finished. Hopefully the entrance area and corridors will be improved. Fabulous location. Well equipped apartment. Louise the owner great to deal with . Apartment had everything we needed for the family . Clean and tidy and again the location of it is fabulous. A truly wonderful apartment situated in a perfect spot with amazing views, everything you could wish for, have had the best time. Property was great - ideally placed for access to beach, Harbour and Purbecks. And the Tesco Express next door saves a lot of time! The flat was clean, light, airy, well decorated and had everything we needed for a week's holiday. We were not expecting beach towels as well as the lovely white bathroom towels! The view over Poole harbour was great and the balcony with table and chairs an added bonus. The walk to the beach took a couple of minutes. The open top bus stopped virtually outside the door and we enjoyed trips to Bournemouth and Swanage. The walk along the beach to the ferry across the mouth of Poole Harbour took about 25 minutes. We had a week of great weather and enjoyed walking to Studland, Old Harry Rocks and Bournemouth. A day on Brownsea Island enabled us to see lots of red squirrells. We really couldn't fault the flat and shopping couldn't have been easier with the well-stocked Tesco Metro by the front door. Sandbanks offers award winning sandy beaches and these are just a short walk out of the rear of the property. A promenade allows for walking or cycling all the way to Bournemouth. Poole Harbour is a delightful area where water sports can be enjoyed. The water sports academy is situated by the property and offers canoeing, windsurfing, paddle boarding etc. Wetsuits can be hired and tuition is offered. The Jazz cafe is a licensed bar and restaurant and is ideally located on the beach front serving breakfast, brunch, lunch and dinner. Local jazz musicians often can be found playing in there. The Sandbanks hotel is open to non residents and has spa facilities, bar and restaurant. Rick Stein has recently opened a restaurant in Sandbanks and there is also the Sandbanks beach cafe and The Caff all near the beach. Just outside the main area of Sandbanks there is also a Loch Fyne restaurant. The National Trusts Brownsea Island is a short ferry trip across the harbour where native red squirrels roam freely and wildlife and natural vegetation can be seen. It offers a great day out for families. Poole park and Upton Country Park are a 5-10 minute drive away and offer facilities for all the family from walking routes to playgrounds for children, cafes as well as a large boating lake offering water sports. Tower Park in Poole offers a cinema, bowling lane and restaurants. Poole itself is a busy town with lots of shops and food outlets as well as a marina showcasing some very large boats as well as providing various trips and excursions. As the property is in a block with other owners, please be aware of this and enter and leave the building quietly please.